For other uses, see Polycarp (disambiguation). Polycarp (/ˈpɒlikɑːrp/; Greek: Πολύκαρπος, Polýkarpos; Latin: Polycarpus; AD 69 – 155) was a 2nd-century Christian bishop of Smyrna. According to the Martyrdom of Polycarp he died a martyr, bound and burned at the stake, then stabbed when the fire failed to touch him. Polycarp is regarded as a saint and Church Father in the Eastern Orthodox, Oriental Orthodox, Catholic, Anglican, and Lutheran churches. His name 'Polycarp' means 'much fruit' in Greek. Both Irenaeus, who as a young man heard Polycarp speak, and Tertullian recorded that Polycarp had been a disciple of John the Apostle. Jerome wrote that Polycarp was a disciple of John and that John had ordained him bishop of Smyrna. The late tradition surrounding Polycarp that expanded upon the Martyrdom is embodied in the Coptic language fragmentary papyri (the "Harris fragments") dating to the 3rd to 6th centuries. These fragments compare and contrast Polycarp with John the Apostle, who, though many people had tried to kill him, was not martyred but died of old age after being exiled to the island of Patmos. Frederick Weidmann, editor of the Harris fragments, interprets them as Smyrnan hagiography addressing Smyrna–Ephesus church rivalries, which "develops the association of Polycarp and John to a degree unwitnessed, so far as we know, either before or since". The fragments echo the Martyrology, and diverge from it. With Clement of Rome and Ignatius of Antioch, Polycarp is regarded as one of three chief Apostolic Fathers. Polycarp is the patron saint of Smyrna. The sole surviving work attributed to him is Polycarp's letter to the Philippians, a mosaic of references to the Greek Scriptures. It, and an account of The Martyrdom of Polycarp, form part of the collection of writings Roman Catholics and some Protestants term "The Apostolic Fathers." This title emphasizes the writings' particular closeness to the apostles in Church traditions. After the Acts of the Apostles, which describes the death of Stephen the Martyrdom is considered one of the earliest genuine accounts of a Christian martyrdom, and is one of the earliest-known Christian documents of this kind. There are two chief sources of information concerning the life of Polycarp: the letter of the Smyrnaeans recounting the martyrdom of Polycarp and the passages in Irenaeus' Adversus Haereses. Other sources are the epistles of Ignatius, which include one to Polycarp and another to the Smyrnaeans, and Polycarp's own letter to the Philippians. In 1999, some third to 6th century Coptic fragments about Polycarp were also published. According to Irenaeus, Polycarp was a companion of Papias, another "hearer of John" as Irenaeus interprets Papias' testimony, and a correspondent of Ignatius of Antioch. Ignatius addressed a letter to him, and mentions him in his letters to the Ephesians and to the Magnesians. I could tell you the place where the blessed Polycarp sat to preach the Word of God. It is yet present to my mind with what gravity he everywhere came in and went out; what was the sanctity of his deportment, the majesty of his countenance; and what were his holy exhortations to the people. I seem to hear him now relate how he conversed with John and many others who had seen Jesus Christ, the words he had heard from their mouths." In particular, he heard the account of Polycarp's discussion with John and with others who had seen Jesus. Irenaeus also reports that Polycarp was converted to Christianity by apostles, was consecrated a bishop, and communicated with many who had seen Jesus. He repeatedly emphasizes the very great age of Polycarp. Polycarp kissed the chains of Ignatius when he passed by Smyrna on the road to Rome for his martyrdom. According to Irenaeus, during the time his fellow Syrian, Anicetus, was the Bishop of Rome, in the 150s or 160, Polycarp visited Rome to discuss the differences that existed between Asia and Rome "with regard to certain things" and especially about the time of the Easter festivals. Irenaeus said that on certain things the two bishops speedily came to an understanding, while as to the time of Easter, each adhered to his own custom, without breaking off communion with the other. Polycarp followed the eastern practice of celebrating the feast on the 14th of Nisan, the day of the Jewish Passover, regardless of what day of the week it fell on. Anicetus followed the western practice of celebrating the feast on the first Sunday after the first full moon after the Spring equinox (March 21). Anicetus—the Roman sources offering it as a mark of special honor—allowed Polycarp to celebrate the Eucharist in his own church. In the Martyrdom, Polycarp is recorded as saying on the day of his death, "Eighty and six years I have served Him, and He has done me no wrong", which could indicate that he was then eighty-six years old or that he may have lived eighty-six years after his conversion. Polycarp goes on to say "How then can I blaspheme my King and Savior? You threaten me with a fire that burns for a season, and after a little while is quenched; but you are ignorant of the fire of everlasting punishment that is prepared for the wicked." Polycarp was burned at the stake and was pierced with a spear for refusing to burn incense to the Roman Emperor. On his farewell, he said "I bless you Father for judging me worthy of this hour, so that in the company of the martyrs I may share the cup of Christ." The date of Polycarp's death is in dispute. Eusebius dates it to the reign of Marcus Aurelius, c. 166–167. However, a post-Eusebian addition to the Martyrdom of Polycarp dates his death to Saturday, February 23, in the proconsulship of Lucius Statius Quadratus — which works out to be 155 or 156. These earlier dates better fit the tradition of his association with Ignatius and John the Evangelist. However, the addition to the Martyrdom cannot be considered reliable on only its own merits. Lightfoot would argue for the earlier date of Polycarp's death, with which Killen would strongly disagree. In addition, some have proposed a date in 177. However the earlier date of 156 is generally accepted. Because the Smyrnaean letter known as the Martyrdom of Polycarp states that Polycarp was taken "on the day of the Sabbath" and killed on "the Great Sabbath," some believe that this is evidence that the Smyrnaeans under Polycarp observed the seventh day Sabbath. William Cave wrote "... the Sabbath or 'Saturday' (for so the word sabbatum is constantly used in the writings of the fathers, when speaking of it as it relates to Christians) was held by them in great veneration, and especially in the Eastern parts honoured with all the public solemnities of religion. This is plain, not only from some passages in Ignatius and Clemens' Constitutions, but from writers of more unquestionable credit and authority. Athanasius, bishop of Alexandria, tells us that they assembled on Saturdays... to worship Jesus Christ, the Lord of the Sabbath." Some feel that the expression the Great Sabbath refers to the Christian Passover or another annual holy day. If so, then Polycarp's martyrdom would have had to occur at least a month after the traditional February 23 dating since according to the Hebrew calendar the earliest time Nisan 14, the date of the Passover, can fall on in any given year is late March. Other "Great Sabbaths" (if this is referring to what are commonly considered to be Jewish holy days, though observed by many early professors of Christ) come in the spring, late summer, and the fall. None occur in winter. It is claimed that the "Great Sabbath" is alluded to in John 7:37. Here it is referred to as "the last day, that great day of the feast" and is a separate annual holy day immediately following the Feast of Tabernacles. Others argue that the gospel writer is referring to the seventh day of the Feast and later refers to the Eighth Day or annual Sabbath in John 9:14. It is more likely that the "Great Sabbath," as referred to in the Martyrdom of Polycarp is alluded to in John 19:31 which points out "that [weekly] Sabbath day" following the "[day of the] preparation" was a "high day" or "great." In any event, however, it is disputable whether such biblical references imply a common practice or just onetime events. Polycarp occupies an important place in the history of the early Christian Church. He is among the earliest Christians whose writings survived. Jerome wrote that Polycarp was a "disciple of the apostle John and by him ordained bishop of Smyrna". He was an elder of an important congregation which was a large contributor to the founding of the Christian Church. He is from an era whose orthodoxy is widely accepted by Eastern Orthodox Churches, Oriental Orthodox Churches, Church of God groups, Sabbatarian groups, mainstream Protestants and Catholics alike. According to David Trobisch, Polycarp may have been the one who compiled, edited, and published the New Testament. All of this makes his writings of great interest. 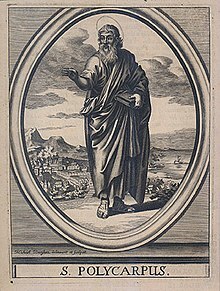 According to Eusebius, Polycrates of Ephesus cited the example of Polycarp in defense of local practices during the Quartodeciman Controversy. Irenaeus, who as a young man had heard Polycarp preach, said of him: "a man who was of much greater weight, and a more steadfast witness of truth, than Valentinus, and Marcion, and the rest of the heretics". Polycarp had learned from apostle John to flee from those who change the divine truth. One day he met in the streets of Rome the heretic Marcion who, resenting that Polycarp did not greet him, said: "Do you know me?" Polycarp replied: "Yes, I know you, the first-born of Satan." Polycarp lived in an age after the deaths of the apostles, when a variety of interpretations of the sayings of Jesus were being preached. His role was to authenticate orthodox teachings through his reputed connection with the apostle John: "a high value was attached to the witness Polycarp could give as to the genuine tradition of old apostolic doctrine", Wace commented, "his testimony condemning as offensive novelties the figments of the heretical teachers". Irenaeus states (iii. 3) that on Polycarp's visit to Rome, his testimony converted many disciples of Marcion and Valentinus. ^ a b c Henry Wace, Dictionary of Christian Biography and Literature to the End of the Sixth Century A.D., with an Account of the Principal Sects and Heresies, s.v. "Polycarpus, bishop of Smyrna". ^ Irenaeus, Adversus Haereses III.3, Polycarp does not quote from the Gospel of John in his surviving letter, which may be an indication that whichever John he knew was not the author of that gospel, or that the gospel was not finished during Polycarp's discipleship with John. Weidmann suggests (Weidmann 1999:132) that the "Harris fragments" may reflect early traditions: "the raw material for a narrative about John and Polycarp may have been in place before Irenaeus; the codification of the significance of a direct line of succession from the apostle John through Polycarp may arguably be linked directly to Irenaeus". ^ Dating according to Frederick W. Weidmann, ed. and tr. Polycarp and John: The Harris Fragments and Their Challenge to the Literary Tradition (University of Notre Dame Press, 1999). One or more of the preceding sentences incorporates text from a publication now in the public domain: Bacchus, Francis Joseph (1911). "St. Polycarp" . In Herbermann, Charles (ed.). Catholic Encyclopedia. 12. New York: Robert Appleton. ^ a b Hartog, Paul (2002). Polycarp and the New Testament. p. 17. ISBN 978-3-16-147419-4. Bacchus, Francis Joseph (1911). "St. Polycarp" . In Herbermann, Charles (ed.). Catholic Encyclopedia. 12. New York: Robert Appleton Company. ^ a b c d Fr. Paolo O. Pirlo, SHMI (1997). "St. Polycarp". My First Book of Saints. Sons of Holy Mary Immaculate - Quality Catholic Publications. pp. 58–59. ISBN 971-91595-4-5. Andrews, Herbert Tom (1911). "Polycarp" . In Chisholm, Hugh (ed.). Encyclopædia Britannica. 22 (11th ed.). Cambridge University Press. pp. 20–22. ^ Staniforth, Maxwell, trans. Early Christian Writings London: Penguin Books (1987): 115. ^ "Polycarp - Martyrdom". Polycarp.net. ^ Cave, Primitive Christianity: or the Religion of the Ancient Christians in the First Ages of the Gospel. 1840, revised edition by H. Cary. Oxford, London, pp. 84–85). Wikimedia Commons has media related to Polycarp of Smyrna. The Martyrdom of Polycarp: The Contemporary Account of His Death in the Letter to the Smyrnaeans.